Note: A version of this review of Richard Diebenkorn: The Berkeley Years 1953-1956 (De Young Museum, June 22–September 29, 2013) originally appeared in the blog Venetian Red. To me there is no painter who more evocatively captures the essence of the California landscape than Richard Diebenkorn. 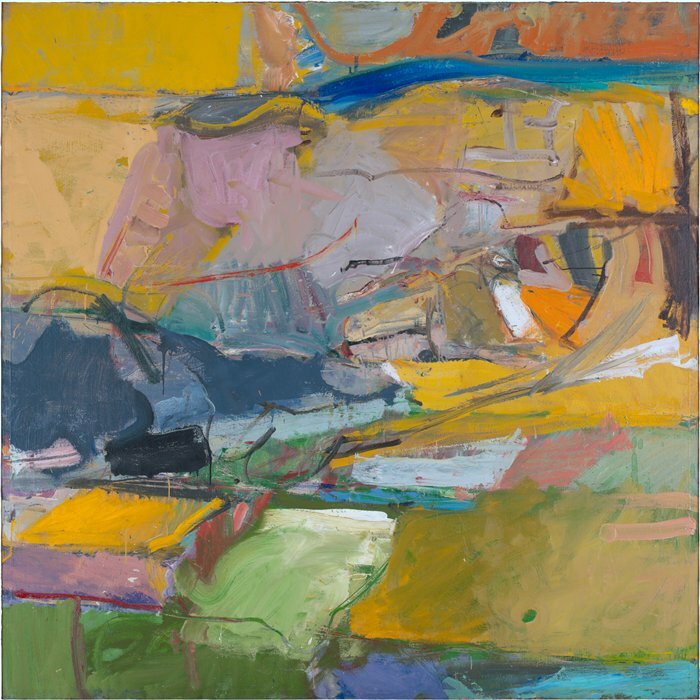 Through a palette that embraces both intensity and subtlety—bright greens and oranges, warm pinks, yellow ochers, cool muted blues, purples, turquoises, and greys—Diebenkorn creates landscape abstractions which manifest the polarity of this Bay Area environment—the intense California sun playing across grassy mountainscapes, and the often cascading fog, which mysteriously shrouds without concealing. 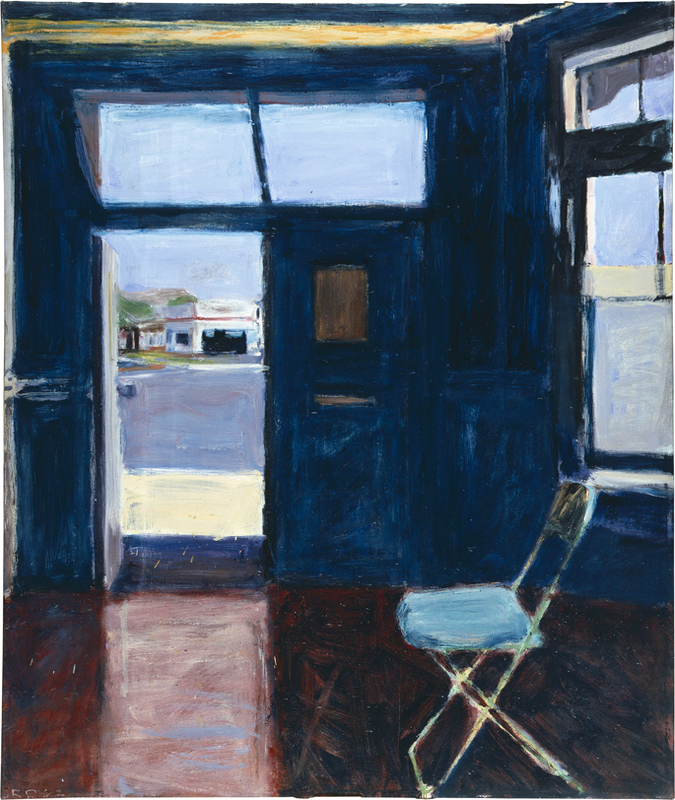 In the period between 1953-55, after he had returned to Berkeley, Diebenkorn painted over 50 large abstractions, and a good many of them are included in this show. The work speaks to the influence of Cézanne and Matisse, who were concerned with defining form through color rather than line. The paintings also reflect gestural elements reminiscent of Gorky and de Kooning, the latter whom he had met when he visited New York in 1946-47 and 1953. Diebenkorn synthesized all these into a sublime achievement of expression and restraint. Witness the frenetic brushwork contained by the shapes. 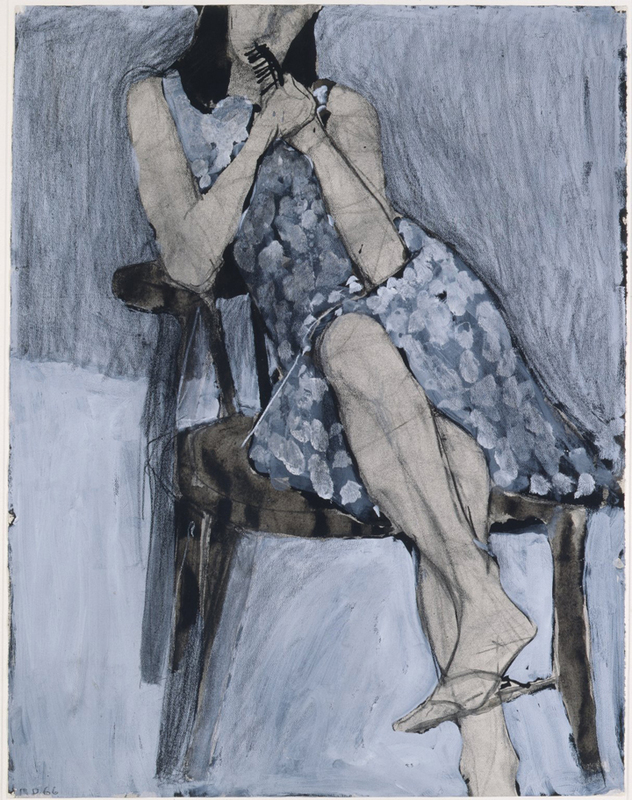 Diebenkorn was a fascile painter, moving easily between the abstract and figurative and there are some exquisitely elegant figural statements in the last rooms of the show. 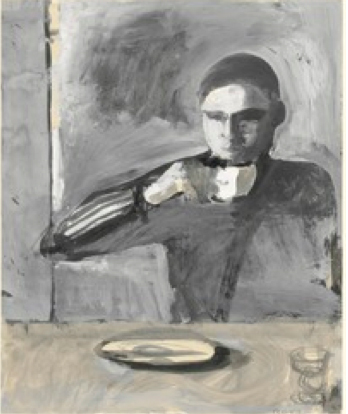 I understand the critic’s complaint about Diebenkorn forcing figures into landscapes; indeed, the more successful works for me focused on either the figure or landscape, and, in the case of the former, my favorites were the intimate works, made with gouache (and and other drawing materials) on paper. ©2013 The Richard Diebenkorn Foundation. I thought it a bold choice to include many figure sketches that a more discriminating curator might have left out. Still I appreciated seeing the missteps intermingled with the stunning successes. Diebenkorn was not afraid to try different subjects and styles. Courage, mistakes can be made! I’ve alway enjoyed his work. Thanks for posting. 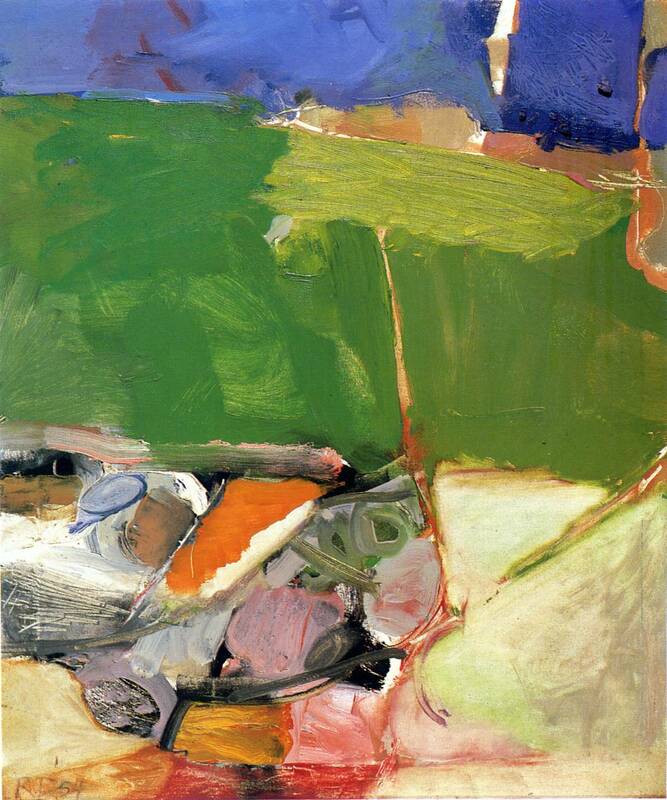 Diebenkorn was such a wonderful colorist, though as a young figurative painter who loved his work, when he went abstract it was like jumping off a cliff. Had long loved the figurative painters John Heliker, Fairfield Porter and Jane Freilicher who stayed in the figurative vein. I don’t think any of them were as spot on as colorists as Diebenkorn. I do remember a more graphic period of abstraction that reminded me and many of landscapes, where lines and fields of color hinted at horizon lines. But I have never seen a whole show of his figurative works and sure wish I could see this show. Tess—Stay tuned! I am working on another post about little seen Diebenkorns, mostly on paper, both abstract and figurative. Hoping to post a number of figurative drawings. I enjoyed this post and wish I could see the show. I’ve only seen these Diebenkorns in books but love the Berkeley work as well as the abstractions from New Mexico. #57 is a fabulous piece. Thanks for posting. Great post Liz. You bring clarity to the mix of works and reactions I also had to the show. I have a few of those paintings on my imaginary wall. Thank you so much for sharing your insights — and for the inspiration! Thank you for a good read and some great pictures to go with it. Liz – I just saw the show yesterday and really appreciate your comments. In total agreement but would add Berkeley #12 and #7 for exquisite layering. I also loved his little painting of Seated Man. Worth another trip if you’re interested in going again? To me, D is about visual memory, not about representation per se – even when he does his representational work. I agree, his abstract work was unbelievable – esp. Room 2. When it comes to his representational work, what I loved to think about was, what made him feel like a work was finally finished? He leaves evidence of his process, his mistakes behind which is thrilling to see. But, what makes it “done?” Woman by the Ocean – he does 22 (or so) revisions of this which Rose Mandel captures – so, why stop there? You artists will have to answer.